Oil content : It is known that if the oil content is relatively higher to the dry mass the mixture does not burn efficiently. So, it must be noted that the amount of resinous material like myrrh and frankincense or any oil content should not exceed the amount of dry materials in the mixture. Oxidizer quantity: The chemical oxidizers in the gum bound incense determines the rate of combustion and hence its amount should be cautiously proportioned. If is too less the incense will not ignite and if the proportion exceeds the required amount the incense will burn out in no time sometimes even without producing any fragrance. Mixture density: Undesirable density in the mixture will lead to uneven distribution of air which will hamper the combustion rate. So it must be checked that too much water is not added while making the dough and incense is not over compressed while being formed. Binders : Binders have to be used in the right proportion so that the mixture does not pulverize when dried. Rope : The concept of incense ropes were started in Nepal and Tibet. It is generally made by rolling incense powder in paper sheets which are twisted tightly and made into ropes. These ropes are then doubled over, entwined again and again till it yields a finely braided two strand rope with a larger bight and a small, pointed end, from which it is lit. Ropes are known to sustain their freshness for a long time and are very east to transport. Loose Powder : These are powdered herbs and spices that are burnt directly on specially designed charcoal tablets. 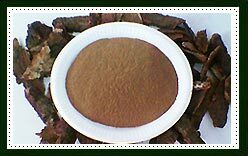 There is another type of powdered incense which is called Smoldering incense or Self-igniting incense which can be burned without the use of charcoal tablets. A small amount of Salt Petre is added to the powdered herbs and is lit directly. The Salt Petre keeps the powdered mixture alive and burning. 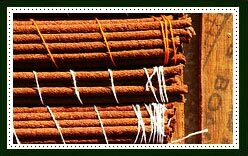 Cored Stick : This is probably the most widely used form of incense throughout the world. It consists of a supporting core of bamboo, or even scandalwood in some high-end varieties, coated by a thick layer of incense material which burns with the core. These incense sticks are also known as "Joss Sticks" and are widely used in India, China and other Asian countries. Solid Stick : These are same as cored sticks except that fact that they do not have the supporting core stick. Solid sticks, as the name suggests, are incense sticks completely made of incense material. They are very brittle and can be broken easily allowing one to determine the exact amount wished to be burnt. This is the most commonly produced form of incense in Japan and Tibet. Cone : Incense cones are known to have been invented in Japan in the 18th century. Although this type of incense burn relatively fast they are very popular due to their catchy shape. They can be burned in a small bowl, in cool steal charms and in a number of other ways depending on how creative you want to get. Coil : These coiled variety of incense were originally used by the Chinese as they tend to burn for a long time. They are generally extruded and shaped into coils and are hung from the ceiling or placed in stands. As soon as the incense stick is ignited, gently extinguish the flame by blowing or fanning. Check if the stick is glowing red and is burning evenly. Place the incense in a proper stand. Make sure you place the stand away from any flammable material or the innocent curiosity of children and pets.